A simple but incredibly useful feature that let you assign sub-duties to staff on a single shift. e.g. if you are running a restaurant and you want to tell one of your workers that they are going to be in charge of opening /closing at day. To get started, enable the task feature from the tab Settings > ShiftPlanning > select Advanced Settingsand enable Enable task feature. 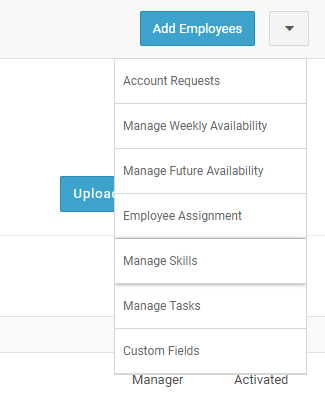 Once enabled, go to the tab Staff, click the arrow down icon next to Add Staff option from the top right and add a list of tasks you will assign to shifts. Let's start to assign tasks to the shifts! Go to the tab ShiftPlanning and create a shift or click an existing desired shift where you want to assign a task. From the shift edit window, you will see a checkmark at the top right of the window. Once you add tasks to Shifts, staff members will see the tasks on shifts as a Shift title or can click on their shift to see the details. Once a shift time starts, the Upcoming Shifts under the Dashboard will show you the start with 'Start' button. Employees should click that button to track the time spent on each of the tasks. From the reports tab, click on the Tasks to see the time activity for each task. Please feel free to let us know of any feedback by emailing support@humanity.com.Happy Scheduling!